Cute and colorful snake prints. 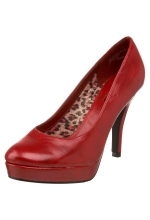 INC International Concepts Mariela slingback platform pumps are a fun way to incorporate the print into your look. Man-made upper. Round open-toe platform pumps with adjustable strap. 3.8cm covered platform and 13cm covered heel.